While looking for a picture for tonight's post, I came across one I shot back in February after a rare snowfall. 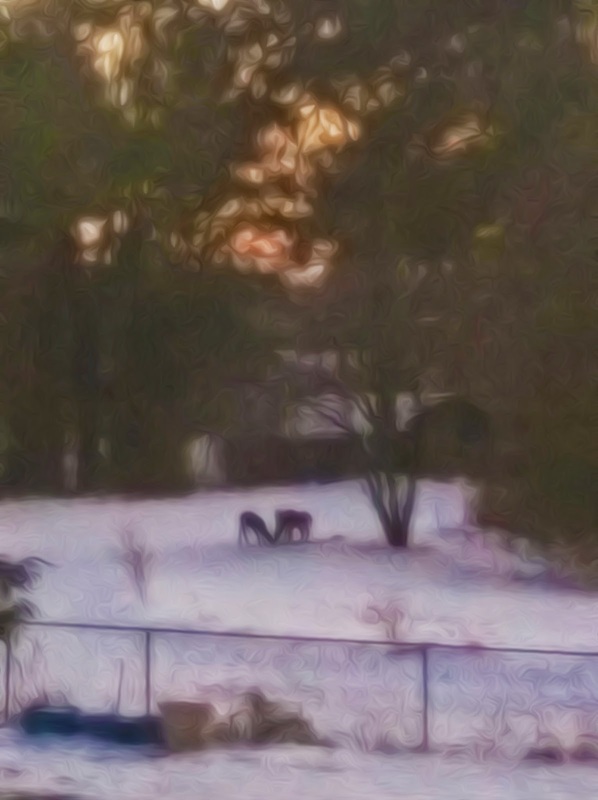 It was taken at sunset, in low-light so the picture of the deer feeding under the apple tree was fuzzy. I almost deleted the photograph, and then I thought that I might be able to run it through the Oil Paint filter on Photoshop to see if anything could be salvaged. As it turns out the muted light of sunset cast a slight rose-glow on the snow adding interest to the scene. Does it work? Who knows the mystery of that? But I thought it was perfect for tonight's post. It rained a little last night and today, clouds as dirty as dishrags hung low in the sky for most of the day. It wasn't freezing, but the combination of a cool north wind and high humidity, made my bones creak whenever I stood too fast. It felt a lot colder than it was. Tonight, we cranked up the fireplace and sat for a long time feeling the warmth bathe over us like a few sips of a fine wine. Next week is Christmas. We have a few more things to finish, but we're so close to being ready we can smell the barn. As a painter knows, the color of snow is an interesting thing as it takes on the cast of the surrounding light and object around it. We think of snow color as white but like water, it takes on different hues. Very interesting subject, color. I hope you have a colorful Christmas. It's a beautiful shot...I'm glad you didn't delete it. We woke to freezing rain this morning. Snow is so much easier to deal with! We're celebrating with the kids this Sunday so I better be ready! Have a good weekend and I hope Jilda is feeling better. That fuzzy thing worked for Monet...or one of those guys. W love sitting by the fire with a glass of wine...it is really cold here, so it feels great! Enjoy the upcoming holidays and all that makes it Christmas!